Uptown has often been classified as Dallas, Texas’ most walkable neighborhood. Boutiques, bistros, biking, vintage shopping—all are accessible in an afternoon’s stroll. It’s an eclectic community that Stoneleigh Companies had its eyes on, so much so that in 2013, the Barrington, Illinois-based developer with Texas connections, made Uptown the location of what it’s calling its most luxurious project. 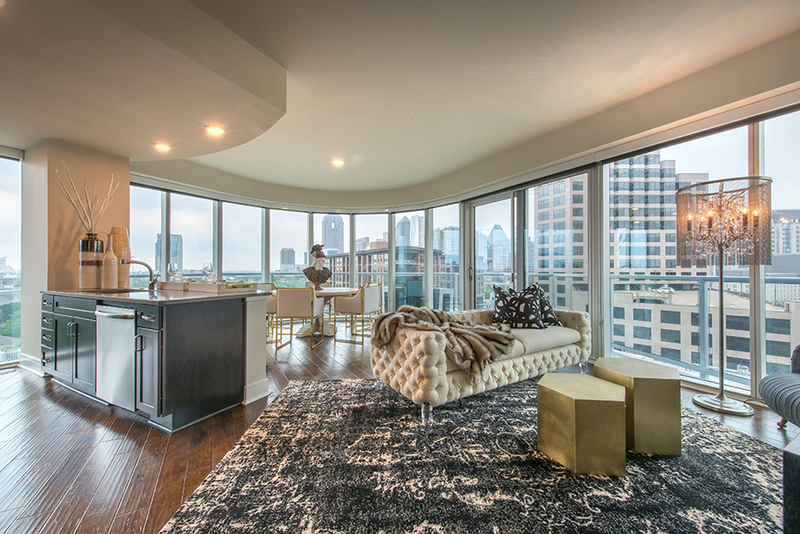 Known as One Uptown, the 20-story high-rise includes 196 apartments—studios to luxury penthouse suites. Designed by Phillip Shepherd, the founder of PWS Architects Inc., a well-known architecture firm in the area, the tower is distinguished by a flowing facade that gives the impression of a glass wave rippling through the air. The first floor includes Fogo De Chão, the iconic Brazilian steakhouse, and Circo, a Tuscan-inspired spinoff of Le Cirque, the renowned French restaurant. Thus far, it seems Dallas is responding well to its new addition, he says. 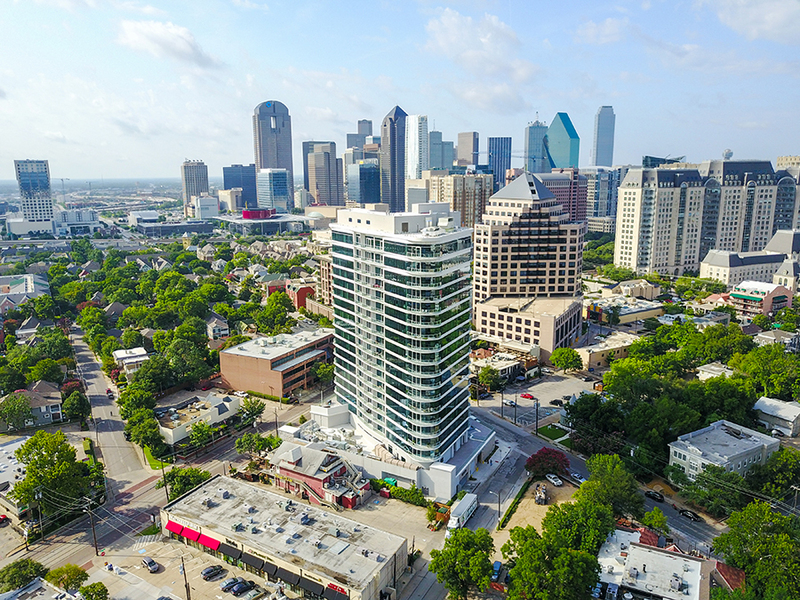 While One Uptown was officially completed in June 2017, eager millennials and baby boomers—the target demographics—were moving in back in February, setting the ceiling for the highest rents in the Dallas Fort-Worth area. One Uptown is not Stoneleigh Companies’ first development in the Lone Star State. Before moving to Chicago in 1991, CEO and Founder Richard F. Cavenaugh spent his early career developing residential properties in Dallas and Houston. During that time, Cavenaugh built relationships with local real estate companies and architects. When he started Stoneleigh Companies in 2008, at the start of the Great Recession, Cavenaugh was able to use those connections to acquire distressed multi-family properties back in Texas. For the first four years, Stoneleigh Companies focused primarily on acquiring existing multi-family real estate, but “as the economy recovered in 2012 and values came back stronger than ever, the company decided it was time to adjust and began developing its own properties, as well,” Swingruber says. Since then, Stoneleigh Companies has developed multi-family apartment high-rises and garden-style communities across Texas, Illinois, Colorado and Tennessee. “We have a set of standards that we take with us no matter where the job is,” Swingruber says. This begins with using superior building materials and methods, but Swingruber says it is diving into the details where the company truly shines. Stoneleigh Companies pays special attention to the floor plan of each apartment, searching for ways to maximize space and providing unique finishing touches with the addition of USB ports, Bluetooth speakers, LED light fixtures and compartmentalized closets. “The amenity package is also a premium in our buildings because we offer more livable square footage than most of our competitors,” Swingruber says. Stoneleigh Companies also sees amenities as an opportunity to add a little local flair. “When we enter a new community, we go in and try to understand not only what is driving the housing market, but what people want out of their ideal living situation,” Swingruber says. In the case of One Uptown, Stoneleigh Companies wanted to offer people of every age the perfect luxury home. “Everyone knows that the number one renting demographic are millennials, but what surprises people is that right behind that is baby boomers and empty nesters,” Swingruber says. Stoneleigh Companies also understood that the needs of 20-somethings just entering the workforce would be extremely different from retirees looking to downsize. To accommodate both sides of the spectrum, the company included a range of apartment styles, from efficient one-room studios to luxury penthouse suites. Complicating matters, zoning requirements limited Stoneleigh Companies to 200 units instead of the more standard 300. “So we had to ask ourselves, how do we make this project not only feasible, but desirable?” Swingruber says. In addition to accommodating multiple lifestyles, Stoneleigh Companies decided One Uptown would also have amenities usually found at a luxury hotel. The development is the only Class A high-rise in Dallas with two pools. 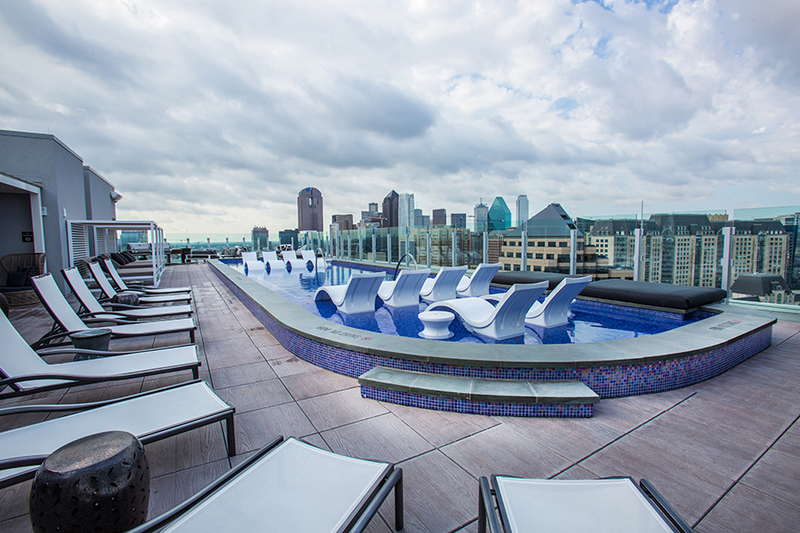 One is located on the rooftop and offers a 360-degree view of the surrounding city. The other is located on the second floor and was designed with a glass bottom that looks down into the porte-cochère. Here, residents enjoy a full-service bar, DJ booth, cabanas and food from Circo, the restaurant on the first floor, and charge it to their room. “It’s turned into a very exciting project because we’ve addressed the needs of two extremely different demographics in the same project,” Swingruber says.